All championship pools have now played 2 matches. Here is where we stand after 3pm games. In the women’s championship division, ’17 quarterfinalist Wisconsin had a solid victory over Iowa State 4-1. This ended Iowa State’s run at the national title. In other matches, California held off Washington University 3-2 to win pool E and advance to championship bracket play. UConn defeated Texas A&M 1-0 and ended the Aggies run for a national championship. 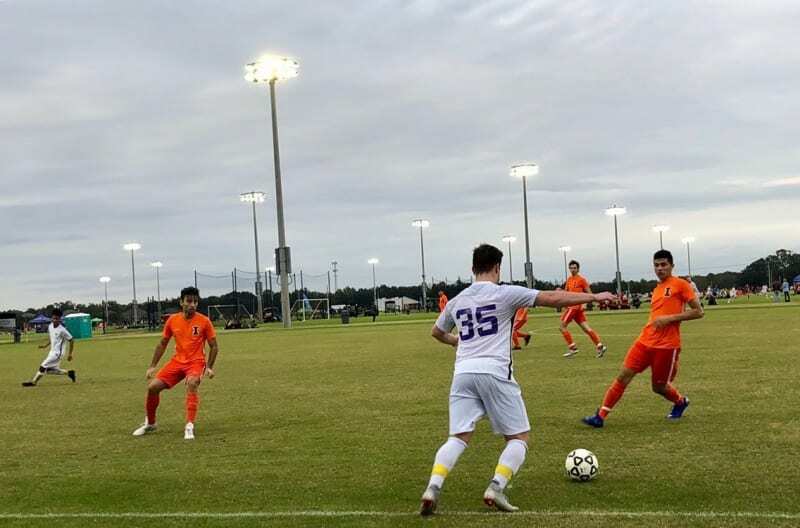 In pool G, Clemson scored in the 2nd half to defeat Kansas 1-0. In the men’s championship division, ’17 finalist Cal Poly is still alive for a national champion run with a 3-1 victory over Texas Tech. In other matches, ’17 semifinalist Florida held off Cincinnati 3-2 and ended Cincinnati’s run for a national championship. In pool F, Ohio State defeated Colorado 3-0 and won pool F in the process. ’17 quarterfinalist Michigan State defeated UTRGV 4-0 and the ended the Vaqueros dream for a national title. In the men’s open division, ’17 quarterfinalist Miami (FL) won over Cal State Fullerton 2-1 while Missouri defeated Minnesota State 3-0 in pool A. In pool B, ’17 quarterfinalist Illinois “Blue” (pictured) defeated Northern Iowa 3-0 and Cornell had a forfeit win over Houston CC. In pool C, ’17 semifinalist San Diego State scored twice to defeat Villanova 2-1 and Georgia College secured a 2-0 victory over LSU.